DVCC Thunder Boys coaches and runners celebrate a ninth (and fourth consecutive) Arizona D1 Cross Country State Championship for Desert Vista High School (Phoenix, AZ). 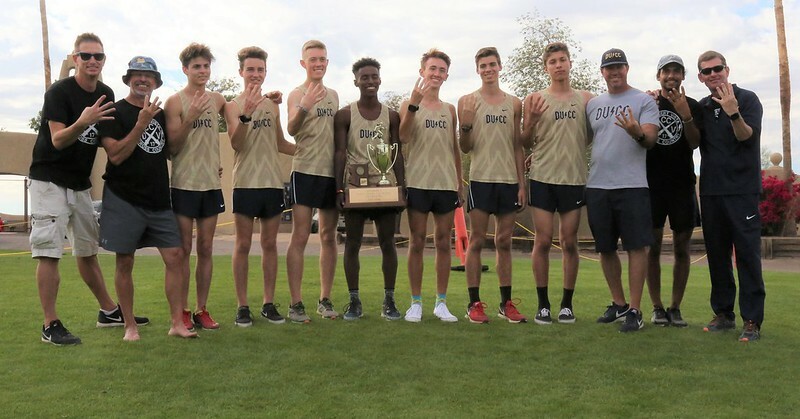 Lightning has struck once again, as the Desert Vista Thunder Boys Cross Country team rolled to its fourth consecutive Arizona State Championship win. This feat increases the Thunder’s total State wins to an impressive nine State Championships! With a mere 34 points, this remarkable squad of DVCC runners scored the lowest point total of any Desert Vista state team in history and was only two points away from the Arizona Division I scoring record. To give an idea of the staggering dominance of this performance, the 2nd-place team, the Highland Hawks, was 96 points behind with a score of 130! DVCC ran a 1:20:45 aggregate time, a school record and the second-fasted ever recorded by any team on the State Championship course at Cave Creek Golf Course. The DVCC 2017 Arizona State Championship team was headed by senior Habtamu Cheney in 2nd place with a time of 15:55, earning a spot on this year's 1st-Team All-State squad. This was his third State Meet, with his previous State Meet performances earning him 1st- and 2nd-Team All-State honors. He has the distinction of completing his career as a three-time State Championship Team Runner. He is the only Desert Vista Athlete to have ever broken 16:00 at multiple State meets; the only other athlete to have ever broken 16:00 was 2015 Arizona D1 Boys State Champion DJ Harris (15:50). Habs ran a personal best of 15:19 at the Desert Twilight Cross Country Festival. Following Habs was senior Reece Donihi in 5th place with a time of 16:06, earning a spot on this year's 1st-Team All-State squad. This was his third State Meet, with his previous State Meet performances earning him 2nd- and 3rd-Team All-State honors. He too has the distinction of completing his career as a three-time State Championship Team Runner. He holds the Desert Vista school record in both the 3-mile and the 5k; this season, Reece ran a blazing 14:28 (3-mile) at the Woodbridge Cross Country Classic and a scorching 15:18 (5k) at Desert Twilight. Right on the heels of Reece was super-sophomore Sammy Van Alstine in 6th place with a time of 16:08, earning a spot on this year's 1st-Team All-State squad. This was his first State Meet. Sammy has had an incredible break-out season this year and ran personal bests of 15:21 at Desert Twilight and 14:45 (3-mile) at Woodbridge. The next runner was senior Bryce Schmisseur in 9th place with a time of 16:14, earning a spot on this year's 2nd-Team All-State squad. This was his first State Meet. Bryce was awarded at the team banquet as the most-improved athlete of the year, a well-deserved honor. Bryce’s personal bests set this season were 15:36 at Desert Twilight (a minute and 15 seconds improvement from his time last year!) and 14:55 (3-mile) at Woodbridge. Following Bryce was senior Nick Thatcher in 13th place with a time of 16:21, earning a spot on this year's 2nd-Team All-State squad. This was his second State Meet and an improvement on his 16th-place (16:30) finish from last year, which had earned him 3rd-Team All-State honors. Nick ran personal records of 15:43 at Twilight and 14:56 (3-mile) at Woodbridge earlier this year. Nick finishes his DVCC Career as a two-time State Champion. Team Co-Captain Aksel Laudon was the next DVCC runner, placing 25th in a time of 16:52. This was his second State Meet and nearly matched his 20th-place (16:33) from last year, which had earned him 3rd-Team All-State honors. Aksel has also had a very successful season, with personal records of 15:36 at Desert Twilight and a blazing 14:35 (3-mile) at Woodbridge. Aksel finishes his DVCC Career as a two-time State Champion. Rounding out the team was senior D’Angelo Piasecki in 33rd place in a time of 17:06, improving on his 38th-place (16:56) finish from 2016. Earlier this season, D’Angelo ran personal bests of 15:29 at Twilight and 14:50 (3-mile) at Woodbridge. D’Angelo finishes his DVCC Career as a two-time State Champion. Overall, the team competed like Champions this season, turning in impressive, never-before-seen performances against elite regional competition at both Desert Twilight and Woodbridge; however, the season isn’t over yet. On November 18th, the DVCC Boys Varsity team will compete at Nike Cross Regionals (NXR) against the best of Southwest region, including teams from Utah, Colorado, Nevada, and New Mexico and attempt to qualify for Nike Cross Nationals (NXN). No Arizona boys cross country team has ever qualified for the Nationals NXN); however, this intrepid squad of Thunder runners is more than capable of doing so: the aggregate time they posted this season at Twilight on the very same course would have won the NXR last year. With the hard work and dedication these runners have put in over the years, they have the fitness to compete with any other team, even on a national level.